James, 33, and the Cavs fell to defeat in the NBA Finals last season – then he opted out of his contract to become an unrestricted free agent. In July it was announced he would be joining the LA Lakers, leaving the Cavs to deal with life after a great. 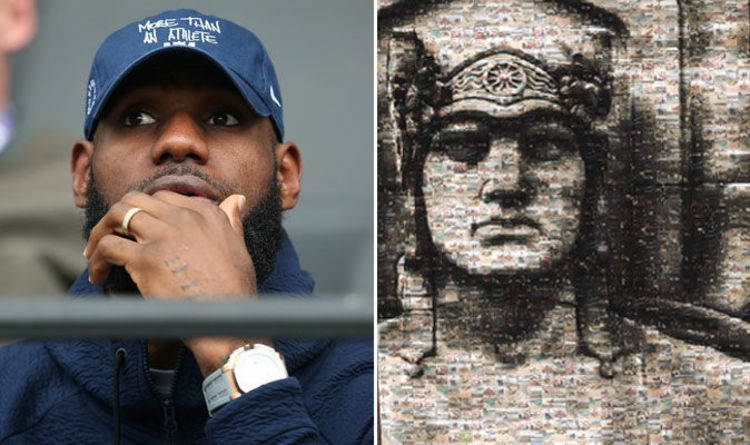 There had been a massive James billboard displayed on the Sherwin-Williams global headquarters wall in downtown Cleveland. And now the Cavs have come up with a plan as to how they will replace it – a mosaic of one of Cleveland’s most recognisable landmarks populated with photographs to be submitted by proud Cavs fans and Clevelanders. The Cavs announced that they will unveil a new banner next month depicting the face of the sandstone Guardian of Transportation statue. The banner will be 110 feet tall and 210 feet wide. The banner will feature a black panel with “ALL FOR THE LAND” and the Cavaliers’ “C” logo to the right of the Guardian. A club statement read: “Our goal was to create a meaningful offering of public art to celebrate The Land and all those who support and love this city and region. “Our hope is that it stirs the emotion and sense of pride, community and celebration of our city in a personal way for those invested in The Land. The Cavaliers also confirmed they are accepting photo submissions to be considered for use as a part of the mosaic. It will be unveiled in early October in conjunction with the start of the new season.